Technical Thursdays - Timber Not Necessary! Why Use Different Parting Tools? Meeting Shaun was one of those happy accidents, so to speak. Purely by chance, I saw some of his recent work at a demo and from there we started talking. I soon found out that here was a turner who had been a professional some time back and then went and did something else before coming back to turning full-time. Not only did the work I see intrigue me, his story also caught my interest. 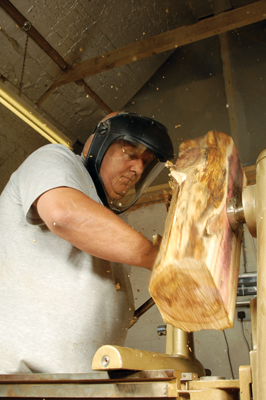 Shaun's workshop is situated in the rural heart of Suffolk, just outside Hadleigh. My travelling to see Shaun was a trip down memory lane in that I passed my late great grandfather's house en route and found myself pondering the rich tradition of farming as well as the woodworking skills of the region concerned. This area is timber-framed-housing heaven and I thought how apt it was to have Shaun, and many other such people with wonderful diverse making and crafting skills, living in this area. is working. In his words, it is â€œthe centre of the workshop.â€ Over a cup of coffee we had a chat about how, why and when Shaun got interested in turning and how he has come about becoming a full-time turner today. for 400 of the things. "Phil would create a marked template or marking stick for me to work on and David brought it home for me to replicate the spindles from," he remembers. He also turned balustrades, knobs, dresser legs and other similar pieces. "I found that I could do these things quite intuitively. I also made eggs, fruit, weed pots, turned stools and parts for wine tables. Most of the items I made had a practical element to them," he tells me. Shaun turned all the way through school and he remembers some of the school governors asking him to make presents and retirement gifts for them. On leaving school - Shaun left with one 'O level' in woodwork as he wasn't too keen on school, and in his opinion, wasn't very good at it - he went to work at his father's business where he remained for 10 years. Shaun says that he still carried on turning and, barring illness, has probably turned something almost every day since he started. "I had various jobs during my lifetime, such as working as a fabricator, and then in the '80s, I enrolled on a Prince's Youth Business Trust Course, which I found to be very helpful. It was then that I started turning full-time." Shaun says that he did "OK, but to be honest, it was very different back then." He tells me that, some years ago, he was working at the Ideal Home Exhibition and took £6,000 in one hour from the sale of bowls, hollow forms and lots of Australian burr pieces. "I was also selling at Covent Garden market and did very well there too. Then came the stock market crash in 1987, which affected many of my customers and, as a result, my business suffered." In response to the economic downturn, Shaun decided to diversify and went on to work in such areas as car sales and valeting, etc. in order to make money. "But during all of this time, I still carried on turning," he finishes. Thinking back to formative times in his life, Shaun recalls attending the second AWGB Seminar, which was back in 1988. It was there that he met Paul Clare: "After the seminar was over and we'd spent much time discussing turning, we went back to my house where we stayed for about two weeks, working on a variety of turnings together." Shaun tells me that since then the pair have travelled to many different places, seeing new sights, meeting turners and searching for wood. "I remember one such trip where we filled up a Fiat Uno to the gunnels with Australian burrs from Craft Supplies and then drove all the way back to Paul's. We have remained good friends ever since the AWGB seminar." After the stock market crash and doing various different things jobs-wise, Shaun decided to become a tree surgeon. He explains that he always took down trees or converted them and quite liked doing this, so he decided that he might as well give it a try as a full-time profession. "I got all the relevant qualifications and also had people working for me. I ended up doing this for about 15 years in the end, but as before, I always carried on turning for pleasure" "By the end of that time, I found myself falling ill for about three and a half years. I was unable to walk properly for about 18 months of this time, which obviously caused me problems in more ways than one," he reflects. Thankfully, Shaun gradually became better, although he was still not 100%. In 2012 he decided to start turning full-time again and to this day, he still loves it. "It is all I have ever wanted to do, really," Shaun says. "I was a good tree surgeon, but I am a better turner. I now sell work through some galleries. I also demonstrate, which I really like. I conquered a personal fear, which is talking in front of people. Of course, this is a problem if you want to demonstrate! I have also started teaching students." 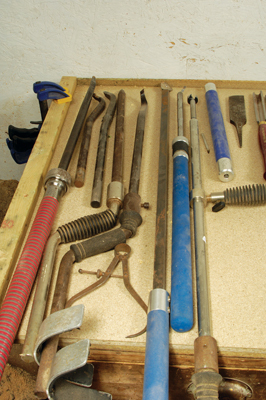 Shaun explains that he doesn't buy a lot of tools, as he likes to keep things simple: "I have enough to do what I need. 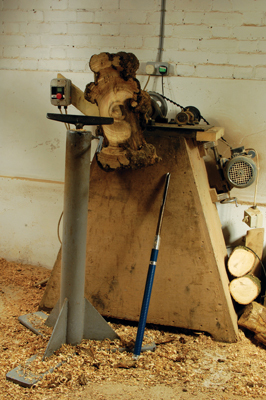 I have two lathes: one - a home-made lathe - is for turning really big items, and this is situated up against the wall. I also have a few extra large 'modified' tools for turning big hollow forms; the other lathe - a Graduate with a modified dropped bed - is in the centre of my workshop and this allows me the room to work on anything up to the capacity of either the inboard or outboard aspects of the lathe. I use this one the most." Shaun also says that he doesn't tend to buy much wood; he does for the chopping boards he makes, but luckily, had ample stock left over from his tree surgeon days, and he explains that he still goes hunting for wood. â€œI have loads of friends who are tree surgeons who always look out for unusual items for me, too, which is handy," Shaun says. Shaun tells me about his latest timber haul, which included some spalted beech (Fagus sylvatica) which he purchased from eBay. 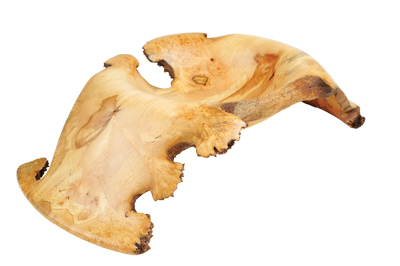 "Spalted beech sells for some silly cheap prices and I also bought a 50kg burr elm (Ulmus procera) chuck." He is also working a lot of wood at the moment from a stately hall moat, which includes logs of beech, oak (Quercus robur) and elm, which have been submerged for a very long time in the mud and silt. Shaun tells me that one elm log measures over 20m in length and about 1m in diameter. He says that the colouring on this particular log is wonderful and he has more logs of various species which he has yet to work with. Shaun says that he is fortunate in the fact that he's had the opportunity to turn some wonderful timber in his lifetime. In terms of his favourites, he cites burrs, but wych elm (Ulmus glabra) burr is his all-time favourite, although he specifies that it must be slightly damp. 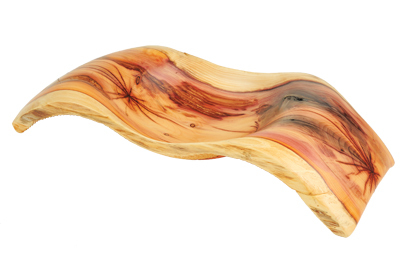 "I like turning items that contain turned decoration such as beads, coves or incisions, but I still want to make sure that the wood is clearly visible." This turner uses no colouring on his pieces other than that which is natural. 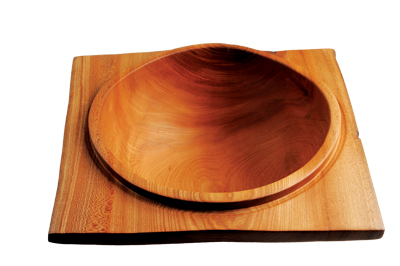 "Wood is a lovely thing to work with and there is so much variation," he finishes. When I ask Shaun to describe his style of work, he says the pieces he makes are, "organic, natural and simple." Shaun says that he has the ability to look at the wood and, according to him, "it's like a picture comes into my head as to what I would like to get from it." He likes adding textural elements to his pieces, which helps to contrast with the smooth surface. Shaun explains that this textured element is often located underneath the form, so that when someone picks it up, they are greeted with a hidden surprise. 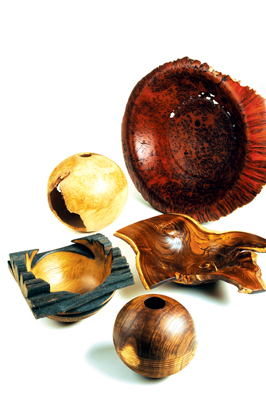 "The majority of my work is natural timber rather than coloured, but I will use black dye and scorching techniques when I feel it appropriate," he says. When asked about his choice of finishes, Shaun tells me that he normally uses lemon or a Danish oil: "I like the matt or satin sheen from them." When I ask Shaun how his typical day starts, he says he begins turning at around 8.30am: "I don't seem to do the same thing each day apart from drinking lots of coffee - I put on the kettle as soon as I get in. I don't have to do much production work, although I will if asked, but I mainly turn gallery items." Shaun says that he recently turned a squashed acacia hollow form, complete with holes, which he turned while damp. The wood was stored for two years and he plans to finish it off after a quick final sanding and a coat of finish. I also made a small grass-tree root spherical form with a natural edge top. Both were completed before midday. I then set up a horse chestnut branch burr with a large burr ball in the centre, and initially turned it between centres - propeller style - before fitting it on a chuck to shape it fully. It was tricky to turn and is on the lathe waiting me to finish it off. The underside is textured and the top will be smooth. 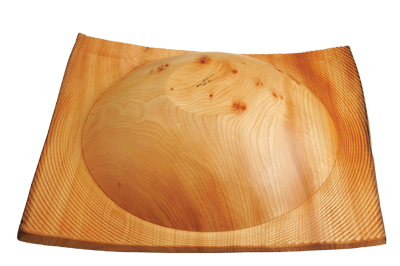 I also set up a piece of phillyrea on the lathe and I hope to turn another spherical hollow form with a natural edge neck." I like Shaun's 'no clutter approach' to turning. Everything has its use and nothing is extraneous to requirement. Shaun's work is a delight to see and wonderfully tactile. I agree that the forms are very organic and they demand to be touched as well as looked at. I like the surprises one gets when one encounters the textural element in some of the work. It can be a roughened incised section or beads or coves, or even scorched and such areas are not always evident when initially looking at the pieces. I am sure that we will see more of Shaun demonstrating at various events and no doubt his work will appear in even more galleries. I wish Shaun all the best for his future endeavours. Unless otherwise stated, all content is © Copyright 2012 GMC Publications LTD or licensed for use by GMC Publications. All rights reserved.